Upon first glance, it didn’t look like much. A small shop with a couple tables and a bar in the back, I was expecting a quick, no-frills place to stop by for some sushi on my lunch break. It took about five minutes to realize how wrong I actually was. Tucked away in a busy shopping center off Airline Highway, Sushi Yamanuha is serving up fresh sushi and a personal dining experience unlike any other in the area. Taking a seat at the bar, I realized I had just given myself a front-row view of my meal as it was prepared. I watched carefully as chef and owner Jared Perkins purposefully prepared roll after roll, putting passion and concentration into every move he made. I decided to hit the ground running and ordered some miso soup and the Sweet and Spicy Salmon Roll, made with crab and cucumbers and topped with seared salmon, sweet and spicy eel sauce and green onions. The fresh flavors of the crab and cucumber paired perfectly with the savory taste of the seared salmon, and the green onions gave a bold bite to the whole experience. Next, I asked Perkins what he would recommend, which led me to the Sweet Potato Roll. 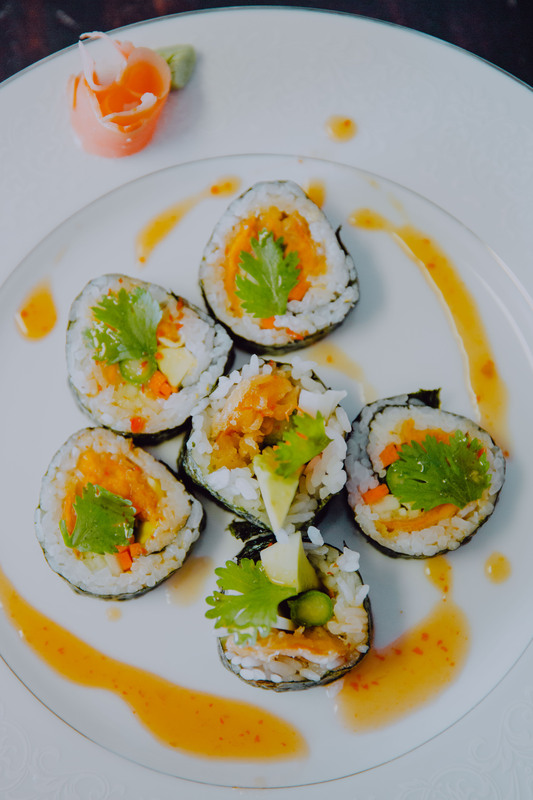 The roll consists of avocado, tempura fried sweet potato, cucumber, carrots and asparagus and is topped with sweet chili sauce and cilantro. I decided to expand my horizons and give it a try. Absolutely. Life. Changing. From the warm and satisfying sweet potato to the surprisingly invigorating taste of the cilantro, I vowed then and there that I would never return to the usual sushi rolls again. As he prepared the rolls of mine and others, I asked him questions about other items on the menu and how to properly enjoy each dish. He carefully walked me though the menu, as if he did not have a multitude of dishes needing attention mere feet from where he was standing. When I did get my roll, Perkins told me he used real plates from Japan to match the techniques he used in making sushi. It was at this point that I began to look around the restaurant again, this time with new eyes. I looked at the plates, with the intricate and authentic details. I noticed a pile of handmade origamis, which Perkins had made himself for kids to enjoy. I watched as Perkins mapped out future plans for the new restaurant from new dishes to interior renovations. I finally saw the restaurant for what it truly was—a labor of love. It’s the passion and energy Perkins puts into the restaurant that makes Sushi Yamanuha what it is. 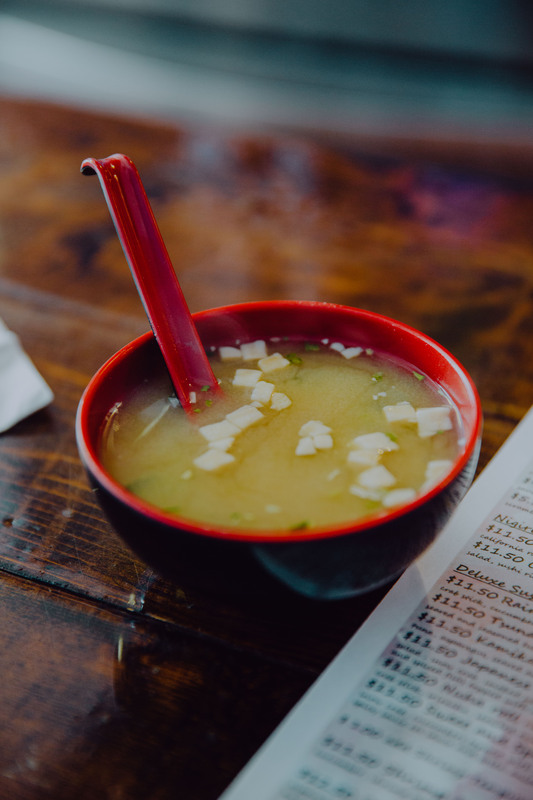 From a simple bowl of miso soup to an intricate deluxe sushi roll, the restaurant will was dishing out high-quality sushi and a welcoming environment at affordable pricing. Sushi Yamanuha gives those who want to learn more about sushi, or even just eat more of it, a great space to do so. Sushi Yamanuha is in the Hammond Air Plaza at 9634 Airline Highway, Suite F2A, and is open daily, 11:30 a.m.-2 p.m. and 4-8 p.m.